To visit the Career Development Office, click here. To view at the latest job postings, visit Symplicity. 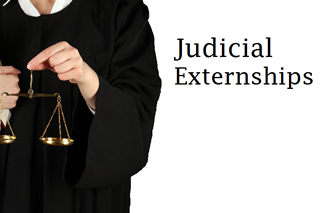 Through participation in the Externship Program, students can earn academic credit for work with a nonprofit organization, a government agency, or a member of the judiciary. (LL.M. students may be eligible for the program on a case‐by-case basis.) The Externship course applications are available on this website. Applications for externship credit are due no later than two (2) weeks before the beginning of the semester. 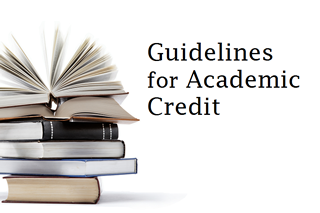 See Guidelines for Academic Credit for Externships. Please email Bill Powers, Director of Internship & Externship Programs, for more information about the Programs. 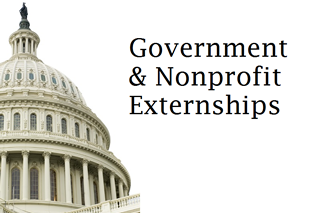 Students apply directly to the nonprofit organization, government agency or judiciary chamber for their externship placement. You should check with the placement for specific requirements and application deadlines. Once a placement is secured, students can apply online to the Judicial Externship Program, the Government and Nonprofit Externship Program, or for a Criminal Practice Externship. Students do not enroll themselves in the externship courses. If your application is approved, you will be enrolled in the program. In order to receive academic credit, students must pay tuition, attend the Externship Programs Orientation, submit the externship course assignments and complete the placement hours.